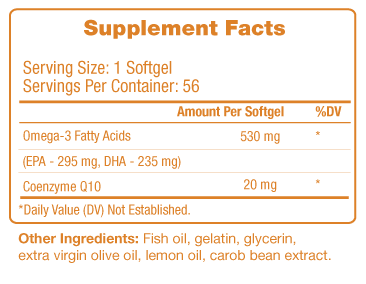 Omega-Q is a unique blend of essential omega fatty acids and the coenzyme Q10 (CoQ10), two of the most powerful ingredients on earth for initiating and sustaining overall health, starting at the cellular level. This balanced combination supports heart and brain function as well as an overall sense of well-being. A balanced combination of essential fatty acids and CoQ-10, containing the highest quality Omega fatty acids, which have been shown to improve heart health, brain function, and sense of overall well-being. The only United States Pharmacopeial Convention (USP) certified oils in the United States, harvested from the world’s most tightly regulated natural fisheries, greatly reducing risk of contaminates. U.S. FDA-notified GRAS (Generally Recognized As Safe) status. 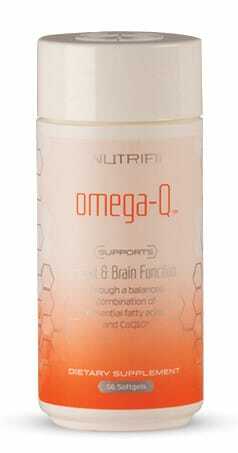 Omega-3 fatty acids found in fish oil directly linked to healthy immune, cardiovascular and neurological systems. Benefits heart and brain health by providing beneficial nutrients EPA and DHA. Premium-quality CoQ10 and Omega-3 fatty acids are life-essential nutrients, playing complementary roles in human health, aiding in normal growth and development while also acting as building blocks for cells in vital organs.